I finished another Chalk Paint project last night! This is a bedside table I’ve had since hubs and I got married. I think we picked it up at an auction for 5 bucks. I tried refinishing it a long, long time ago, but there were spots in the wood that I just couldn’t make better. 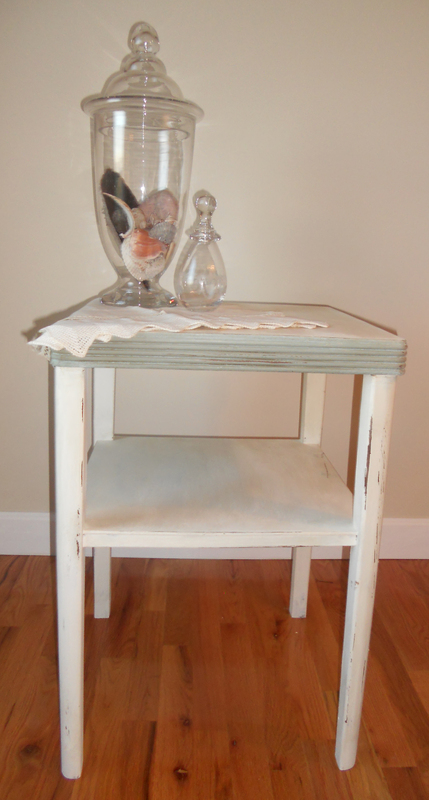 I decided this week the solution was…Chalk Paint! The main body is in Old White and the side, grooved part is in Duck Egg Blue. I used clear wax on it before I sanded it down a bit, and then used the dark wax on the blue grooves. I’m not sure I’m all that keen on that bit so I might redo that. I decided I’ll stare at it for a couple days and see if I change my mind. My next project will be the mammoth of an oak chair I saved from the side of the road.